Since many of you are using your Surface Pro for Manga Studio or Clip Studio Paint, I wanted to start a post comparing performance of cpu-intensive actions. Please recommend actions for me to perform and clock in the comment section below. For the first test, I downloaded this example file contained on the English language Clip Studio Paint site. 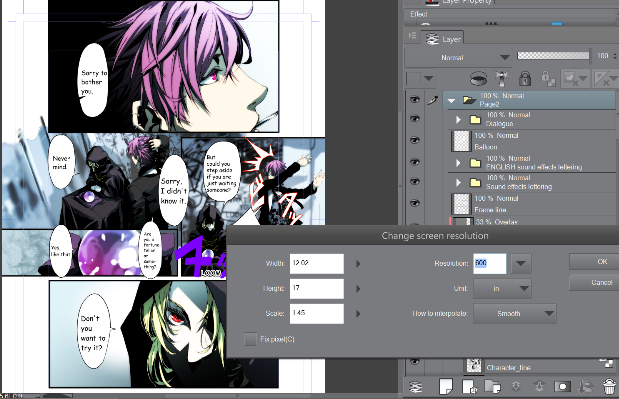 It consists of too many layers to count and is 8.27 x 11.69 inches at 600 dpi. For the test, I rescaled the image by 145% to 12.02 x 17 inches at 600 dpi. Interpolation was set to smooth. The operation took 2:59 on the Surface Pro and 2:35 on the Surface Pro 2, a 15.5% time savings. Saving the resulting 291 MB file took about the same time: 1:56. I'll update this post as I perform other tests.